There is nothing worse than those cheesy Christmas gifts. Poor teachers received dozens "best teacher ever mugs" and a years supply of chocolates. I have a very dear friend who is a teacher at an exclusive Adelaide private school. I remember when my dearest daughter #1 started school, asking her what presents she loves to get from her students at Christmas time. I was expecting her to mention all the expensive chocolates and other beautiful items. Yet she said her favourite things were the delicious homemade goods. So this year I have decided to make delicious homemade produce for all of the class and extracurricula teachers. My mum's lemon tree has lemons, lemons and more lemons. So many lemons we don't know what to do with them all. 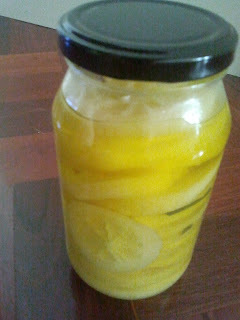 I have decided to make preserved lemons. I have followed Stephanie Alexander's recipe from her wonderful book "A Shared Table". The recipe is extremely easy, however it takes numerou days. I made one jar and it just looks so inviting, I have decided they will be great to give away for Christmas. I have started my next batch of preserved lemons. 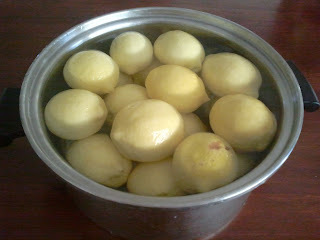 Here they are in a large pot, soaking in water. It is so easy to do, I am wondering why more people don't do it. I will update this with the recipe, after Mr S has finished with the computer!! !